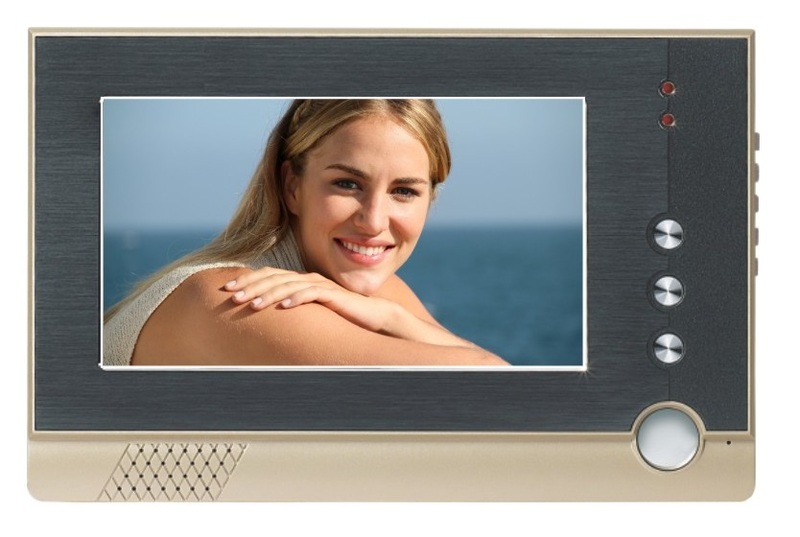 The BE-820C7 is our 7 inch black and tan framed, color monitor with front of screen touch buttons. It also has full touch screen functionality. With its scratchproof, vandal proof, modern construction, the BE-820C7 color monitor offers features such as two-way communication, full screen viewing, alarm connection, door release abilities, card access and key fobs. Our 7-inch color monitor allows entry code access and only requires one CAT-5 wire connection for complete functionality. Weighing only two pounds, the BE-820C7 monitor is housed in alloy material similar to a laptop exterior. Our systems support as many as 300 color monitors in order to accommodate large facilities. Apartments, condominiums, business offices, parking garages, schools & colleges, and assisted living facilities are only a few venues that benefit from our BE-820C7 color monitors.